I just returned home on Sunday from Toronto, where I attended Write Canada 2015. Over the next few weeks I plan to share some of the teaching and tips I picked up while I was there, but today I’ll share an overview. How has God gifted you, and what are you doing with that gift? Are you in God’s Word? Are you interpreting God’s Word accurately? How are you using your writing to shine God’s light on issues? Are you giving glory to God for successes? Faculty members at Write Canada graciously make themselves available to have conversations, answer questions, listen to queries, and share their knowledge and expertise. A special opportunity to network took place Saturday during lunch in a discussion regarding Aboriginal Christian writing in Canada. Dorene Meyer invited James Peters and Deborah Ironstand to join her on a panel. Dorene started the discussion by apologizing for the way Canadians have treated First Nations people. 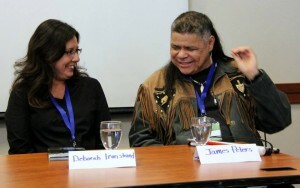 James and Deborah acknowledged the apology and offered forgiveness. Then Deborah read “The Sweet Presence,” a story published in Northern Writers Volume 5. She wept as she read. This is the first opportunity she’s ever had to read her story publicly. James shared his testimony of how God saved him. He said he wants to share his story in schools and churches so that young people don’t have to live through what he did. 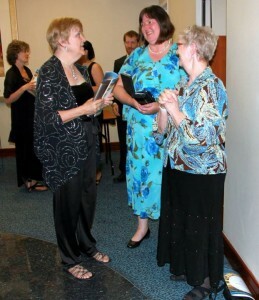 Doreen invited anyone who would be interested in publishing and promoting Aboriginal Christian writers to contact her. I’m excited to see where this will lead. Everything is better when you have friends! 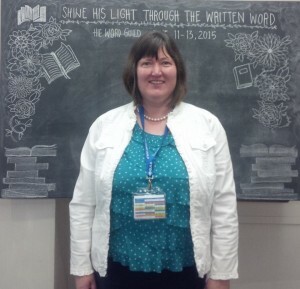 I enjoyed hugging and chatting with many of my Christian writing friends over the weekend. Write Canada provided many opportunities to hear about challenges and victories we’ve experienced and to celebrate excellence in writing. (The Word Awards Gala took place Saturday evening, immediately following the Write Canada conference.) Meeting face-to-face with friends I’ve met only through social media made it even better. I also enjoyed meeting people I’d never met before and adding them to my circle of friends. Organizers of Write Canada arranged to have Stephen G. Woo, a professional photographer, available to take pictures on an appointment basis. He made the shoot fun, and when he found out I’ve written a book about Twitter, he customized the photos around that. I expected to have one or maybe two pictures to choose from, but he sent me twenty-one! Here are some of my favourites. Pictures he took at The Word Awards Gala are available to view on Facebook. As you can tell, Write Canada is a great event. I’m thankful God made a way for me to attend. Tell us about your favourite conference to attend! Hi Ruth. It was great to see you again. So glad the conference was a blessing to you.And your photos are awesome. Thanks for all you did to make conference the blessing it was. Praying God will clearly direct your next steps. I especially like the picture with your chin in your hands where you are looking off into the distance to the left. I always feel a mixture of excitement and envy after hearing about Write Canada. One of these years!!!! I hope you get to attend Write Canada soon. I know it would be mutually beneficial for you and others who attend. Great pictures Ruth! Also liked the Focus questions. Encouraging to hear about First Nations stories being shared. Good to see you again, Ruth, and I’m looking forward to what you’ll share from your notes. We were in a number of the same classes, but not all. Great photos, and I agree with Tracy — love that one of you looking left. It’s like you’re musing over something.